English sculptor. The son of a carpenter, he was apprenticed to a wood carver in Sheffield but left to come to London, c. 1802, to study at the Royal Academy Schools. 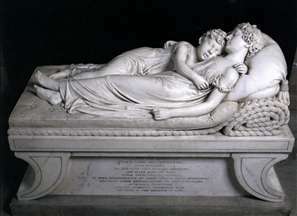 Until about 1804 his work included painted portraits, but after that date he confined himself to sculpture. 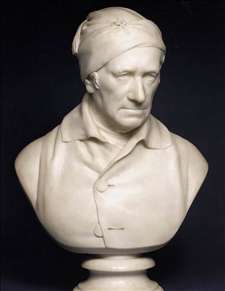 His portrait bust of the Revd J. Horne-Took, exhibited at the Royal Academy in 1811 (Fitzwilliam, Cambridge), brought him fame, and he succeeded Nollekens as the most successful sculptor of portrait busts in England. Once he was well established, Chantrey, like Nollekens, did little of the cutting of the marble himself. 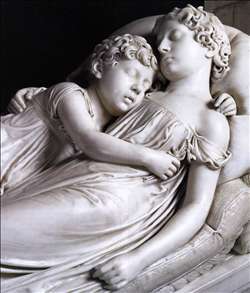 His enormous practice included statues and church monuments as well as busts; his monument to the Robinson children (1817) in Lichfield Cathedral and his bronze equestrian statue of George IV (1828) in Trafalgar Square are his best-known works in these fields. He became extremely wealthy, and besides being very generous during his life he left the bulk of his fortune of £ 50,000 to the Royal Academy, the interest to be used for the purchase of works of Fine Art of the highest merit executed within the shores of Great Britain . These are now housed in the Tate Gallery. See more details about "Bust of Revd. John Horne-Tooke"
See more details about "Mrs. Siddons"
See more details about "The Sleeping Children"
See more details about "The Sleeping Children "